This book provides a timely and accessible introduction to the foundational ideas associated with the human development school of thought. It examines its conceptual evolution during the post-colonial era, and discusses how various institutions of the UN system have tried to engage with this issue, both in terms of intellectual and technical advance, and operationally. 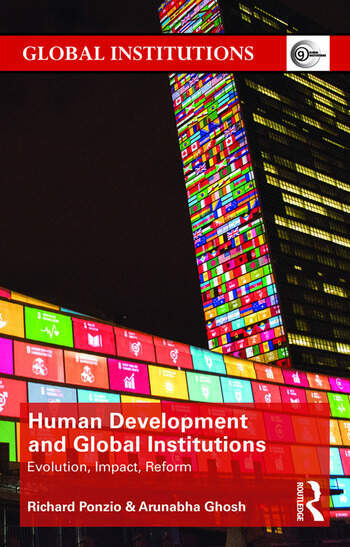 Showing that human development has had a profound impact on shaping the policy agenda and programming priorities of global institutions, it argues that human development has helped to preserve the continued vitality of major multilateral development programs, funds, and agencies. It also details how human development faces new risks and threats, caused by political, economic, social, and environmental forces which are highlighted in a series of engaging case studies on trade, water, energy, the environment, democracy, human rights, and peacebuilding. The book also makes the case for why human development remains relevant in an increasingly globalized world, while asking whether global institutions will be able to sustain political and moral support from their member states and powerful non-state actors. It argues that fresh new perspectives on human development are now urgently needed to fill critical gaps across borders and entire regions. A positive, forward-looking agenda for the future of global governance would have to engage with new issues such as the Sustainable Development Goals, energy transitions, resource scarcity, and expansion of democratic governance within and between nations. Redefining the overall nature and specific characteristics of what constitutes human progress in an increasingly integrated and interdependent world, this book serves as a primer for scholars and graduate students of international relations and development. It is also relevant to scholars of economics, political science, history, sociology, and women’s studies. Richard Ponzio is head of the Global Governance Program at The Hague Institute for Global Justice, where he serves as project director for the Commission on Global Security, Justice & Governance. He is formerly a senior adviser in the US State Department’s Office of the Special Representative for Afghanistan and Pakistan. Richard has served with the UN in Afghanistan, Bosnia, Kosovo, New York, Pakistan, Sierra Leone, and the Solomon Islands. Dr Arunabha Ghosh is CEO, Council on Energy, Environment and Water, India. Widely published, with work experience in 35 countries and having previously worked at Princeton, Oxford, the UN Development Programme, and the World Trade Organization, Arunabha advises governments, industry, and civil society around the world on: energy and resources security, renewable energy, water governance, climate governance, energy-trade-climate linkages, and international regimes. He is, most recently, co-author of Climate Change: A Risk Assessment (2015).